We’ve made it to the fifth week of Lent! 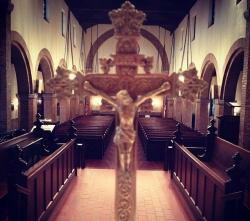 Holy Week starts this Sunday… and Easter is just around the corner. With that being said- if you’ve not taken advantage of Lent, or if you have- Holy Week is central to the practice of our faith. It is a reenactment, revival, and great education all rolled into one. It deepens our faith, gives us strength and courage, assures us of Christ’s love and forgiveness, and is a wonderful opportunity to show God adoration and thanksgiving- to show Him we love Him enough to make the most holy week a priority as well. This Sunday is Palm Sunday- and at the 10:30 service we will begin on the lawn reenacting Jesus’ triumphant entry into Jerusalem. From there, we move onto a dramatic reading of His crucifixion. It is a stirring day emotionally- and one not to be missed. Please make every effort to be with us. The next major celebration of Holy Week is Maundy Thursday… the day that remembers the institution of the Holy Eucharist, the priesthood, the Mandadate to love one another as Christ loves us by the washing of feet by the priest… and lastly remembers Christ’s arrest by the stripping of the altar which leaves the Church very bare and empty. After the mass, we set up an altar of repose where the faithful are invited to watch with Jesus in the Garden of Gethsemane. This service is powerful and intimate and one that is extremely important to many and if you’ve never been- you simply must come and see. Good Friday is a very different service from what we are normally accustomed. This is a day the remembers Christ’s Crucifixion and death. It has several major parts. One is a formal act of repentance through prayers and Litanies of prayers that ask God’s forgiveness and mercy upon the world. We also ‘venerate the Cross’ during the service a Crucifix is brought out and we make an act of love and thanksgiving for Christ’s sacrifice for us- we are shown His love and we return it in kind. The night before Easter is called the Easter Vigil during which time the Church officially transitions from Lent to Easter. This service recalls the story of our Salvation, focuses on Christ’s resurrection and celebrates our new Life in Baptism. I issue a challenge to you all to make this most holy time of year the highest of priorities. You will be better for it, and in realms eternal showing love and thanksgiving and adoration to our Lord mean more that most anything else you could be about this next week. This Sunday, March 25th, is Palm Sunday and our children are in for a wonderful treat. Dr. Cleve Johnson, Legend Palm Cross maker will be joining all our classes and leading us in making Palm Crosses. Please join us downstairs in the Sunday School wing at 9:30 for what promises to be a wonderful experience for our children. Come early for the best coffee and dough nuts around! Easter Sunday the church will be bursting to overflowing with the glories of the Resurrection of Our Lord Jesus Christ. As is our tradition, we place Easter lilies and other flowers in the Church as an offering to God in thanksgiving for our salvation. 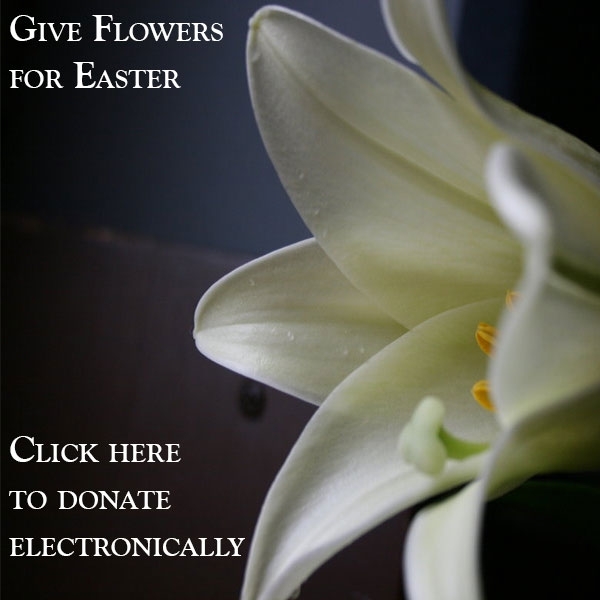 To accomplish this, and to allow the faithful to give a gift to God as well, we offer the opportunity to donate Easter flowers for the altar on Easter morning. To do so, click on the picture to our website where there is a place for you to tell us what you want to give the flowers in thanksgiving for/memory of. You may use your pay pal or credit card to pay; mail a check to the office or place your check in the offering plate (please note on the memo line “Easter Flower Fund”. The suggested donation is $15.00. Palm Sunday (March 25) – To recall Jesus’ entry into Jerusalem that led to his death, we begin with a celebration with palms. We hear the full story of Jesus’ suffering and death from Mark’s gospel, spoken by many voices. We end in silence to prepare for the week ahead. The service begins outside on the lawn at 10:30 and proceeds by procession into the church. Maundy Thursday (March 29) – On this night, Jesus shared his final meal with his disciples and gave them a new commandment to love one another, which he enacted by washing their feet. 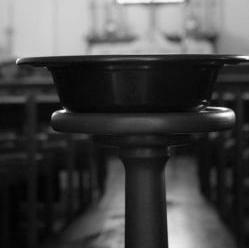 The service of foot washing, Eucharist, and stripping of the altar in the Nave begins at 6:00pm. A nursery is available for those needing child care, and as always, children are encouraged to participate in the foot washing. Good Friday (March 30) – The Liturgy of the day is at 12:05. We hear the full story of Jesus’ suffering and death from Mark’s gospel. Child care is available. Holy Saturday (March 31) – The Liturgy for this day begins at 7:30pm on the lawn where we bless the new Paschal Candle and recall the early baptismal ritual of the church. We light a new fire for Easter and hear scripture that tell the story of God’s salvation. Child care is available. 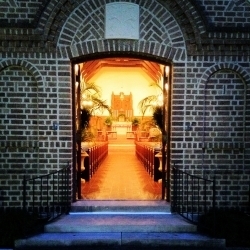 Easter Day (APRIL 1) – 8:00 Low Mass in the Nave followed by an Easter Egg Hunt at 9:30 with 1,000 eggs hidden on the lawn and a lovely Easter reception. 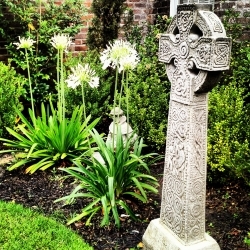 We will flower the Cross following the Egg Hunt, so bring your flowers from home. The 10:30 Mass is one of our finest with hymns, full choir and festive music. The Altar Flower Chart for 2018 is on the board in the Sacristy hallway and we need the faithful to sign up to take a Sunday in memory or thanksgiving of someone or an event. If you are unable to come to the parish to sign up, you are more than welcome to call the parish office with a date you would like and we will try our best to accommodate you. When a person takes a Sunday, they contact the parish to make known their thanksgiving/memorial wording for the Sunday bulletin. 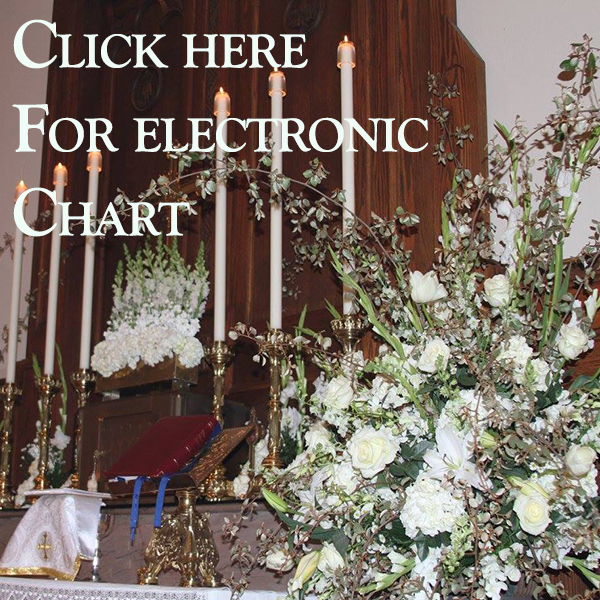 Mr. Randy Jackson of Flowertyme is a communicant, but you may choose which florist you would like to deal with, or you can make the arrangement yourself and place them in the sanctuary. SIGN UP TO FEED OUR E.Y.C. We need your help feeding our E.Y.C. members on Sunday evenings. Their meeting begins at 6:00 p.m. at the parish. There is a sign up sheet located on the board in the sacristy hallway with dates that are available. For more information, contact the Parish Office. Grab your scissors and keep an eye out for the Box Tops for Education logo on the products you use every day. Once you have finished the product, clip the Box Top before you throw it away. Be sure to look over the whole box. There is a container labeled for your Box Tops on the table in the hallway. 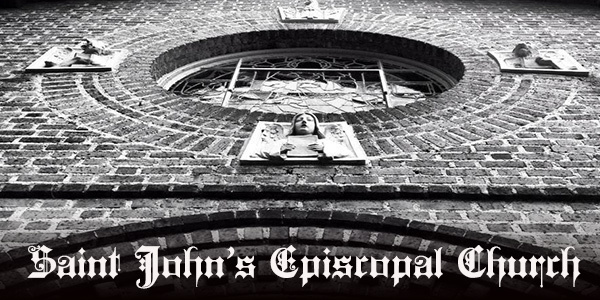 Copyright © 2018 Saint John’s Episcopal Church, All rights reserved.